Maui'd Forever now Using PersonalizedWedding.com to produce Hawaiian toasting flutes. 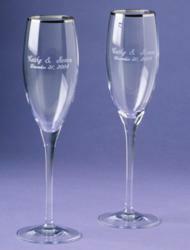 Maui'd Forever now Using PersonalizedWedding.com to produce Hawaiian toasting flutes. Maui'd Forever is one of Hawaii’s few full service, all-Hawaiian Islands wedding planner and coordinator. Founded in 2003 by entrepreneur Mark Steffan, the company operates on the Hawaiian Islands of Oahu, Maui, Kauai and the Big Island of Hawaii. They use over 150 different wedding vendors and still find the need to add additional members to their team. They had been using a Maui based company to produce their personalized wedding toasting flutes but they stopped shipping to the other Hawaiian Islands. That is why they needed to find another source and found PersonalizedWedding.com. PersonalizedWedding.com specializes in unique and fully customizable products that are perfect for any wedding. Engraved glassware and printed favors are just some of the special items that can be created. Whether one is looking for a pair of champagne flutes for a wedding toast, or customized favors for a hundred wedding guests, PersonalizedWedding.com has it all. They customize all of their products in-house and can work with any design or concept. One can borrow from their design ideas, or one can "start from scratch" and make their own unique layout. Everything from PersonalizedWedding.com is permanently engraved or printed. They do not use stickers to personalize any of their items and they use only the best production methods to produce fine custom products. That is one of the reasons Maui'd Forever chose this particular company. Their custom engraved glassware is primarily made using the premier method of sandblasting. This method produces an engraving that is superior to other engraving methods, and it also allows for full flexibility with designs. During the sandblasting process, a film mask is created for each individual item. These masks are hand applied onto the product, then the glasses are placed into a sandblasting cabinet and hand blasted with a stream of high pressure air and abrasive. For engraving materials such as wood, marble, acrylic, and some coated metals, they use laser engravers. The laser achieves its engraving mark with heat, allowing for extremely detailed and accurate product markings. On all of their printed products they use pad printers to produce vibrant color markings. This type of printing is ideal for marking paper, cardboard, and fabric products. If one is looking for something to give the bride and groom, they can customize wood and metal picture frames, toasting flutes, cake servers, peppermills, and photo albums.They have even done rosewood gift boxes, bottle openers, flasks and wine boxes. PersonalizedWedding.com can even create unique party favors for their wedding guests.They can customize glassware, coasters, bags, napkins, water bottles and more. The company is located in Reno, Nev. and services customers around the country. Their talented staff works hard to create these unique wedding and reception products.. These flutes are available in many of the Maui'd Forever Wedding Packages. For more information about their products, visit PersonalizedWedding.com.